A group that helped create the Nepal Climate Observatory - Pyramid approaches a deal with the Italian funding agency that once bankrolled it. Scientists hope that a Himalayan climate observatory that had its funding cut four years ago could be back in action by early next year. 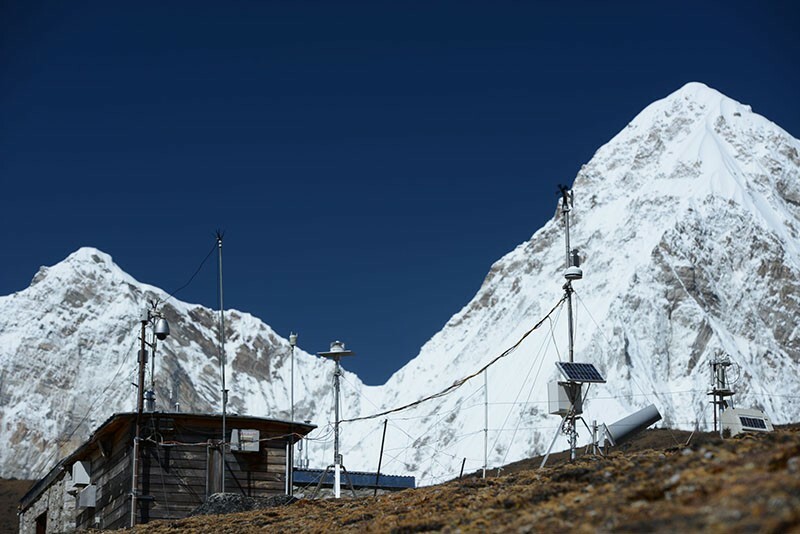 Managers of the Nepal Climate Observatory - Pyramid station say they are close to reaching an agreement with the Italian National Research Council (CNR). The council helped set up the station near the base of Mount Everest in 2006 but stopped funding it in 2014 because of how its budgets were managed. “For the first time in four years, I am extremely optimistic about the fate of the station,” says philanthropist and climber Agostino Da Polenza, who heads the Ev-K2-CNR Association, a non-profit group that promotes research in mountain areas and helped to set up the Nepal Climate Observatory-Pyramid, one of the highest climate observatories in the world. If the deal goes through, the observatory will resume collecting data on atmospheric processes at high altitudes. Climate researchers say these measurements are crucial for understanding how pollution influences climate patterns. Da Polenza says that a meeting this month between the Ev-K2-CNR Association and the CNR to discuss the observatory’s future was overwhelmingly positive, and he hopes that, come March, technicians will be on their way to the station to switch on its instruments. But he declined to reveal any further details, saying he did not want to jeopardize a potential deal before it has been finalized. The Nepal Climate Observatory - Pyramid is part of the Global Atmosphere Watch network, run by the United Nations World Meteorological Organization in Geneva, Switzerland. The programme combines data from hundreds of stations around the world to build a picture of global climate. The Nepal observatory is perfectly positioned to study how the climate in the Himalayas is being influenced by pollution, such as anthropogenic emissions from biomass burning and agriculture, transported from South Asia, says Paolo Bonasoni, the observatory’s research leader and a scientist with the Institute of Atmospheric Sciences and Climate at CNR in Bologna. Atmospheric scientist Oksana Tarasova, who heads the GAW network, says that various kinds of pollution travel up the sides of the Himalayan mountain chain and then mix together. When pollution such as ammonia and oxides of nitrogen interact with other airborne chemicals and sunlight, they create compounds known as secondary aerosols, which alter the climate and affect the weather, she says. The Nepal observatory is one of the few that can simultaneously measure aerosols and reactive gases and other compounds, she says. Its instruments have shown that the air surrounding the Himalayas changes quickly from clean to polluted when pulses of dirty air travel up from urban centres; when this happens before the monsoon period, it triggers bursts of cloud condensation. Since 2014, members of the Ev-K2-CNR Association have donated their time or money to maintain the observatory at a vastly reduced capacity. Most of the instruments are not being used, and have been turned off to prevent them from deteriorating in the extreme winter conditions. Less than two months ago, the group feared it would have to close the station altogether, as its members struggled to secure a new source of money to update and run the instruments. The observatory’s reduced capacity has hampered scientists’ ability to study complex environmental problems, says Bhupesh Adhikary, who models chemical transport at the International Centre for Integrated Mountain Development in Kathmandu. Tarasova is excited that the observatory could soon resume full data collection again. “This is an important station, a rare one and a real treasure in our programme,” she says.